Jo Nesbø has been labeled as the next Stieg Larsson. What do you think of his books? His 'Harry Hole' series is about your typical crime investigator - a lonely, alcoholic man battling both authority and ex-girlfriend issues but Jo Nesbø does an extrodinarily good job of building such a strong character out of what can be criticised as a far from original crime fiction character setup. It tells the story of a string of murders that have terrorised the local town - a murderer who leaves behind snowmen in the gardens of his victims. With equal parts suspense and gore, it deserves the 5/5 rating that it has been given by some book reviews. Not only does Nesbø deal with the personal issues of the protagonist, engaging intelligently with the causes and effects of these but he also manages to keep up the fast-paced, page turning quality of the book, building up more suspense than is often managable along the way. Jo Nesbø has been compared to Stieg Larsson many times but in my opinion he is almost better. If you're looking for a novel filled with suspense, terror and plenty of bloodshed without troublesome dialogues and complex social issues then Jo Nesbø is the man for you. 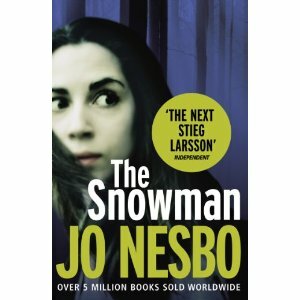 I have only read The Snowman the 7th book in Nesbø's 'Harry Hole' series. It was given to me as an early christmas present and I took it with me when I travelled to Sweden where I was spending Christmas. I began reading it while I was travelling but it wasn't until we reached my boyfriend's winter cabin that I really got round to reading it properly. Curled up in an armchair by the fire, wrapped up tight in a thick, Norwegian blanket I began what I had not realised was going to be a very gory journey. Sitting on a plane, in broad daylight the novel had seemed relatively tame but sitting in a darkened cabin up in the mountains, surrounded by snow (and, following a visit from my boyfriend's little nieces, a terrifying snowman of our own smiling outside) it quickly became quite horrifying. In terms of a horror rating I wouldn't give it more than a 6 or a 7, it was the gore that got to me the most. Have you read The Snowman? What 'horror-rating' would you give to it? i have not read nesbo or the millenium trilogy, but i saw the mil trilogy movies and LOVED them. i've heard the books are fairly dry and cumbersome, but they're sooo popular! i imagine they'll resurge even more when the american movie versions are released.